The World Bank released the latest purchasing power parity (PPP) estimates of GDP on April 30. These estimates are published once every 5 to 6 years, based on the elaborate survey of prices across the world conducted by the International Comparison of Prices (ICP) project. The latest estimates pertain to the year 2011, while the previous estimates were for 2005. The new data affords an opportunity to revisit that hardy perennial of global policy questions: To what extent is the Chinese currency undervalued? And our surprising answer is: perhaps not at all. We can say with some confidence that the renminbi is now fairly valued, which is a striking change from even 2005, when the currency was undervalued by nearly 30 percent. This change possibly heralds the end of nearly two decades of China’s mercantilist development strategy based on boosting exports by keeping the currency artificially low. The methodology for estimating currency undervaluation and overvaluation using PPP estimates, as well as the contrast between the PPP-based and other macroeconomy-based approaches by Cline (2013)and Gagnon (2012), are discussed in greater detail in Subramanian (2010). Here we only present the results derived from the PPP-based approach. The basic idea underlying the PPP-approach is that there is a positive relationship between prices and income per capita known as the Balassa-Samuelson effect: Poorer countries usually have lower prices in the nontradable goods and services sector and hence a lower general price level, which allows resources to flow to tradable sectors: A low price level thus reflects a depreciated exchange rate. This relationship is stable enough to provide a benchmark: For a given level of income, we can infer what the level of prices and hence the equilibrium exchange rate should be. Prices below this level indicate undervaluation, and above this level, overvaluation. Note: A country below (above) either line has an under (over)-valued exchange rate. For the purpose of this post, we use two different ways to determine this benchmark: a linear regression, where the price level is simply a linear function of GDP per capita, and a quadratic function, where we take into account the fact that this relationship is weak for poor countries (and hence the downward sloping part of the curve) and robust for emerging markets (the upward sloping part).1 The figure illustrates the two models. We estimate the relationship for two different samples, and given our agnosticism on the choice of the “right” sample or model, we express our main result as an average of those four estimates (2 models times 2 samples). 2 Given the error margins intrinsic in such estimations, broad trends rather than precise numbers should be the important take-aways from our analysis. For China, we find that the renminbi was only slightly undervalued in 2011—by around 1.7 percent, and even possibly overvalued (see table) if we are to believe the quadratic model. The ICP data relate to 2011. However, we can use the estimates for 2011 and project the equilibrium valuation for 2014. Between 2011 and end-March 2014, China’s per capita GDP grew about 13 percentage points faster than the United States, which should translate into an appreciation of around 3.2 percent.4 The actual real appreciation of the renminbi between end-2011 and March 2014 was about 7 percent according to the Bank for International Settlements. This suggests that the average undervaluation until 2011 of about 1.7 percent has been effectively eliminated since then by the renminbi’s appreciation (over and above the level required by China’s GDP growth). The renminbi in 2014 is thus fairly valued. This estimate is of potential historic significance. Provided China does not reverse its exchange rate policy, by lapsing back into large-scale intervention and engineering renminbi depreciations as it is doing now, it will have put behind the pillar of its development strategy, which has involved maintaining a cheap currency to boost exports. The significance of our estimates, based on the most recent data released, is this: Not only are broad macroeconomic aggregates (for example, the current account deficit) moving in the right direction, but underlying relative price movements (and signals) seem to have shifted in a way to stop the flow of resources into export sectors, which now allows China to proceed with its rebalancing strategy. Put differently, there is room for cautious optimism that imbalances will not reemerge because underlying fundamentals are being addressed. The end of Chinese mercantilism—and relief for the rest of the world—may be in sight. 1. Technically, the linear model is expressed as: ln (Pi) = α + β ln (Yi) + εi, where P and Y are the price and income per capita levels for each country, and the quadratic model is ln (Pi) = α + β ln (Yi) + γ (ln (Yi))^2 + εi. To be consistent between the 2005 and 2011 estimations, we normalize the price level to that of the United States. 2. Sample 1 excludes oil exporters and sample 2 additionally excludes small countries (population below one million inhabitants) and those which were not part of the benchmark in the 2005 round (all of which can potentially have problematic price level data). We also ran the regressions for a sample including all countries and the results remain broadly similar. The chart corresponds to sample 2. 3. It is true that in 2011 China intervened heavily in foreign exchange markets, to the tune of about $450 billion, but any impact from this action on underlying prices—which is captured in a PPP-based approach—would have taken some time. 4. The linear model yields a slope of 0.246—so the expected appreciation is 0.246*.13=3.2 percent. Other models point to a slightly lower value. Note to rest of the world: Stop bugging China on undervaluation of its currency. Today, two economists at the Peterson Institute for International Economics, perhaps the world’s top econ think tank, used the numbers to conclude that the Chinese yuan was no longer undervalued, as it has been for decades. “This estimate is of potential historic significance,” conclude Martin Kessler and Arvind Subramanian. “The end of Chinese mercantilism—and relief for the rest of the world—may be in sight,” they write in a Peterson blog post. 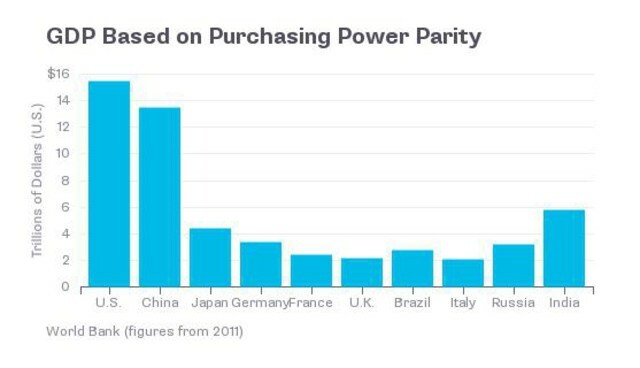 To review, the World Bank re-estimated the size of different economies using a calculation known as purchasing power parity (PPP), which tries to estimate relative wealth by looking at differing prices in different countries for the same goods or services. Such comparisons usually show that developing countries aren’t as poor as they seem. For instance: A haircut in Beijing costs far less than a haircut in Boston, which means the wealth of a Chinese person with a full head of hair –- let’s call him Mr. Wang—is greater than usually understood. 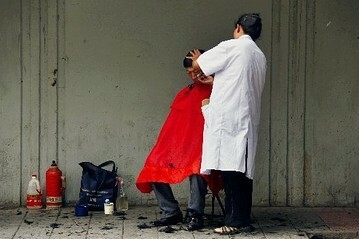 Cheaper in China: haircuts. Not cheaper: iPhones, BMWs and other imports. But Mr. Wang doesn’t buy things in PPP; he buys them using actual currency. When he leaves the hair salon and buys an import, say a U.S.iPhone or a German car, his yuan are converted into dollars or euros at the current exchange rate. 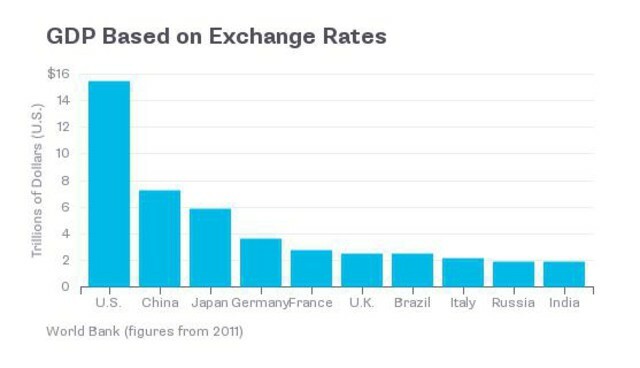 Given that Chinese earn far less money than Americans or Germans on average, exchange rate comparisons accentuate the gap between developing and developed nations. Most comparisons of international power are done using the prevailing exchange rate, not PPP. Now, back to the value of the yuan. Messrs. Kessler and Subramanian use the new PPP calculations to estimate that between 2011 and March 2014 China’s per-capita GDP grew about 13 percentage points faster than the U.S., which they say should translate into a currency appreciation of around 3.2%. Since the actual appreciation was 7%, that suggests the yuan appreciated too rapidly during that period and made up for some of the time when the yuan didn’t strengthen rapidly enough. “The renminbi in 2014 is thus fairly valued,” they conclude. Any estimate of a currency’s valuation is a black art. Different economists use different methods and come up with different conclusions, especially if there isn’t an obvious undervaluation or overvaluation. It’s hardly surprising that many countries accuse the others of deliberately undervaluing their currencies, and use estimates of currency valuation to make their point. Nearly every government has the same strategy for growth — export more — and a cheap currency helps exporters. The U.S. Congress has made China’s currency a political issue for years; before that, Congress’s target was the Japanese yen. Developing nations, in return, accuse the U.S., through the Federal Reserve’s bond-buying policy known as quantitative easing, of slapping a fancy name on a plan to drive down the value of the dollar. Will the Yuan's Slide Continue? The most likely outcome of the Peterson Institute calculations is that China will be able to point to them as a way to justify its currency policy and the U.S. Congress will do its best to ignore them. Alan Tonelson, an economist for the U.S. Business and Industry Council, a business group that regularly accuses China of playing different games to disadvantage U.S. exporters, was dismissive of the Kessler-Subramanian calculations. The argument isn’t settled and likely won’t be soon, if ever. The International Monetary Fund is due to come up with its assessment of the yuan’s valuation during the summer. Last year, the IMF said the yuan was “moderately” undervalued—IMF lingo for 5% to 10% undervalued. The IMF figures China’s trade surplus will rise over the coming years. So it’s a safe bet that the IMF, which doesn’t use PPP, will again be in the yuan-is-undervalued camp. –Bob Davis. Follow him on Twitter @bobdavis187. This post originally appeared on Real Time Economics. Seeking to give the yuan a greater role on the world stage, China’s central bank is tirelessly promoting it as a tool for international trade and a future reserve currency. But experts say one necessary step toward making the yuan a global reserve currency is political reform — and that’s not on Beijing’s agenda. The People’s Bank of China has madeimpressive headway in its campaign to promote the yuan. The fast growth of China’s economy, coupled with policy support from the government, has allowed the yuan to grab a sizable share of China’s own trade, starting from zero less than five years ago. Standard Chartered Bank estimates the yuan could account for 28% of the nation’s trade by 2020 — double current levels — and become the fourth-largest global payment currency, ranking it behind the dollar, euro and pound sterling. A few global central banks – including those from Australia, Nigeria, Chile and Japan — have said they plan to put some of their reserves in Chinese currency. Many more have announced swap agreements with the PBOC, setting the stage for broader use of the yuan outside China’s borders. But more remains to be done. Speaking last week at a conference on the internationalization of the yuan, Masahiro Kawai, former dean and CEO of the Asian Development Bank Institute, the multilateral bank’s think tank, noted there’s a fairly long list of requirements to convince global investors that a currency is a safe place to store assets — one of which is an independent legal system. “A one-party system has trouble ensuring this,” Mr. Kawai said. The dollar remains the main global reserve currency, but all of the other major global currencies — the euro, pound sterling, Japanese yen, Australian and Canadian dollars and the Swiss franc – are from Western-style democracies. Cornell University economist Eswar Prasad suggests it might be possible for China to join the reserve club on its own terms – as the world’s second largest economy, “China has been creating its own playbook,” he said — but it won’t be easy. Mr. Prasad said an independent judiciary is indeed a big part of the “magic sauce” for determining what makes the grade as a reserve currency. It also requires transparency and public institutions the world trusts. It’s important that the currency be fully convertible. That’s one reason Chinese policy makers have been pushing so hard to ease the movement of capital into and out of the country – a goal that might be mostly achieved by 2020, according to some estimates. The central bank recently widened the currency’s daily trading band to give the market more say in setting its value. More open and liquid financial markets are also on everyone’s must-have list. There too China is making important strides, though it has a long way to go. – Political reforms that improve the regime’s transparency, accountability and representativeness. China could become the world’s biggest economy in the next decade or so but without such reforms, it would still be far short of the criteria for attaining reserve currency status, Prof. Huang suggested. “The use of a nation’s currency in international trade and as a reserve currency is not determined by the People’s Bank of China,” he said. February’s surprise fall in Chinese exports may have less to do with the strength of foreign demand than with changing perceptions of the Chinese yuan. A glance at the mainland’s trade data with Hong Kong suggests the strong capital inflows that boosted China’s export data in early 2013 have begun to wane as the outlook for the yuan currency becomes less rosy. China on Saturday reported a rare trade deficit of nearly $23 billion in February, the largest in two years. That reflected an 18% drop in exports from a year ago, probably linked to speculative fund movements back then. “We believe the weak export numbers reflect both fundamental weakness and capital outflows due to [yuan] depreciation in February,” Nomura economist Zhang Zhiwei said in a note to clients. China’s exports early last year were unusually strong — they surged 25% in January 2013 and almost 22% in February – leading to suspicion that the data were distorted. Economists said the numbers were inflated by over-reporting of exports in order to skirt capital controls and bring more foreign exchange into China. Exporters were looking to take advantage of a strengthening yuan currency, which climbed nearly 3% last year. Fast-forward to 2014. In the first two months of this year the People’s Bank of China has allowed more volatility in yuan trading, helping to curb speculative capital inflows disguised as foreign trade. The yuan dropped nearly 1.4% in February and touched a 10-month low, throwing yuan bulls off balance. After taking a breather last week, the yuan has continued to fall this week. The Chinese central bank has set its benchmark exchange rate weaker every day, at 6.1327 per dollar Tuesday from 6.1312 Monday and 6.1201 last Friday. Tuesday morning, the yuan was trading at 6.1359 to the dollar. The data on trade with Hong Kong, a major platform for bringing funds onshore, is particularly telling: Over the first two months of 2014 exports to Hong Kong fell 21% on-year, while last year they surged 61% in January-February. “With the significant [yuan] depreciation observed in February, we think… an additional factor behind the weak export data in February is that the incentive for fake exports disappeared,” J.P. MorganJPM +0.39% economist Zhu Haibin said. That’s likely to affect trade data in coming months as well. Last May, foreign exchange regulators warned of tough penalties for companies found to have falsified export reports, leading to a big slowdown in export growth after May. That means that until May 2014, exports may continue to look weak in comparison to the inflated figures a year earlier. Most analysts say China’s economic fundamentals haven’t really deteriorated to a significant extent – it may just be speculative inflows taking a break.